Srinagar:(Mudasir Ahmad )No police officer in Kashmir has in recent times been as warmly received as Basant Kumar Rath. The valley’s youth mobbed the IPS officer for selfies while commuters nodded at his eccentric means of bringing discipline on congested Srinagar roads. So when the J&K government on Tuesday, November 13, suddenly shunted him out from the post of inspector general of Traffic Police, J&K, the anger in the Valley was nothing unexpected. “In the interests of the administration,” read the order that broke the news about Rath’s transfer just nine months after he took charge. The buzz in the valley, however, is that a virtual spat with the newly elected Srinagar mayor, Junaid Mattu, backed by Sajad Lone and the BJP, was real reason for his premature transfer to the comparatively insignificant home guards department. “He (Rath) should not have called him (Mattu) a cabbage,” governor S.P. Malik told the local daily Greater Kashmir. Mattu’s comment sparked outrage from environmentalists including Shakil Ramshoo. Two days later, Rath took a jibe at Mattu. “Wetlands are precious and a vital part of our ecosystem. Only a cabbage will think otherwise,” he tweeted. In response, Mattu, who is a former spokesperson of the National Conference, said Basant was “unwell”. Netizens called out his insensitivity, forcing Mattu to come up with a clarification. The spat, however, didn’t end there. The traffic police chief hit out at Mattu the next day over his statement that he had sought a review of traffic plans in the city in view of “traffic management issues”. “Not your domain,” Rath shot back at Mattu. By then, the “cabbage” metaphor was already trending on social media, with some users sharing photos of the green leafy vegetable on Facebook and others listing its health benefits. Soon, rumour of Rath’s removal started doing rounds, especially after former director general of police S.P .Vaid wrote about it. 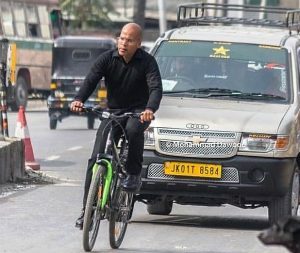 “Social media agog with rumours of transfer of Basant Rath @KangriCarrier IGP Traffic; I hope it isn’t true. He may follow unorthodox ways, but his honesty and dynamism is appreciable & commendable,” Vaid wrote on November 12, a day before Rath was unceremoniously moved out of the traffic department. Jammu: Inspector General of Police (Traffic) Basant Rath, right, during a recent traffic inspection Jammu. “Transfer of IGP Basant Rath comes across as nothing but a vindictive step, with clear link to the recent spat with the political class…His anti-elite streak, anger against the political elite reflected and absorbed anger on the street, bringing him closer to the world’s most disempowered and dispossessed population,” said journalist Peerzada Ashiq. Rath had won appreciation in Kashmir for going after the powerful while managing traffic and for connecting with ordinary people on the road. 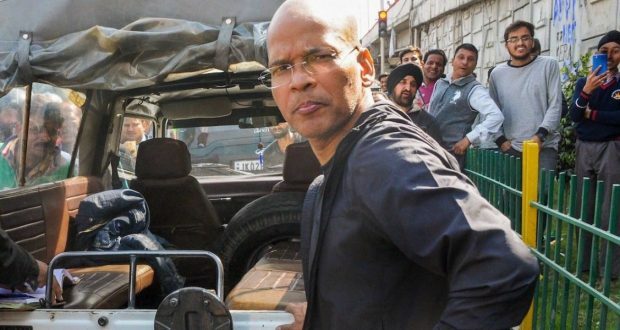 “Those talking good governance and accountability have reportedly removed IGP traffic Basant Rath,” Langate MLA Engineer Rasheed wrote on Facebook. For Ashok Kumar, the reason for Rath’s transfer was the love and respect he earned in Kashmir. “You are too scary for the establishment dost (friend). They can’t deal with your popularity among ordinary folk. This is the first time I am seeing such endorsement by Kashmiris for not only a cop but a non-Kashmiri. You should be very proud,” Kumar wrote. IAS officer Shah Faesal wrote the ‘best farewell’ to Basant would be when people continue to follow traffic rules and ask others to do the same even when Rath is no longer on the streets. Rath was born in 1972 in Odisha and studied Sociology at the Jawaharlal Nehru University in New Delhi. A maverick poet-cop, Rath arrived on the scene in ‘Singham’ style when he took charge in February this year. Within days, he established himself as an uncompromising officer, taking on anyone who broke traffic rules. This included seizing an Audi car belonging to a senior IPS officer’s son to issuing a challan against a police vehicle, Rath sent across the message – he meant business. Unlike his predecessors, he came out on the road to implement rules himself. “If people are using roads, how would I have made a difference by staying in my office chamber? If children face difficulty on roads in the morning, how would I have served them by sitting in my chair? 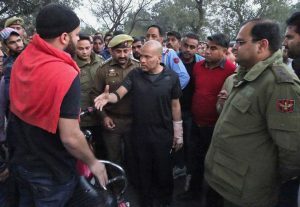 The beauty about being a top traffic cop in J&K was that I could touch people’s lives,” Rath told The Wire even as he refused to comment on his transfer. A man of slender frame with neatly shaved head, Rath was usually seen chatting with passersby, exchanging smiles with children. But traffic rule violators were always on his radar. “I am privileged to have got a chance to work among the people, on the streets of J&K. I am grateful for the kind of affection I got from the youth and the elderly and I will always hold them close to my heart,” Rath said. His modus operandi, though, did not go down well even with his seniors. Vaid once warned him against his “illegal, unbecoming conduct” and “strange activities unwarranted of a police officer”. Earlier this year, Union home ministry also ordered an inquiry into his action. But nothing has come out of the inquiry so far. “The only thing that matters to me is a Kashmiri boy or a girl walking up to me and asking for a selfie. That is a biggest achievement of my life irrespective of what my detractors say. I don’t care if they say it is theatrics,” said an unfazed Rath. What next? “I am not going anywhere, not on deputation. Delhi is polluted. I haven’t joined IPS to go on deputation. I will stay in J&K till my retirement. It is a beautiful place…the potential to connect with masses here is immense. I am here to make a difference no matter which posting I get. The outspoken Rath has kept at his unconventional style even as controversy and commendations chased him. He vows to keep it up even if it may cost him his job as state’s traffic chief. “I don’t worry about the politically connected. My Bou (mother) always wanted me to be like this,” said Basant.